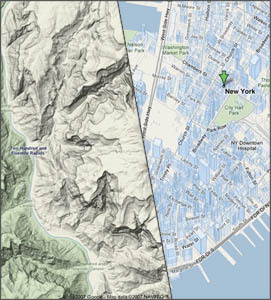 Google Maps now has a terrain view, showing images of 3D terrain and, if the city is big enough, buildings. New York’s Map has translucent buildings, and of course the Grand Canyon is a pretty good display of the terrain imagery. When I first read about this new feature at Download Squad I was afraid that they would be doing topographic lines or something, but the soft rendered terrain they are using is clean while still communicating quite a bit of (non-scientific) information. Terrain view has now become my Google Maps view of choice. Clear and organized enough to work as a street map view, but with enough detail to give you an idea of what you’re getting yourself into. I’m super impressed.